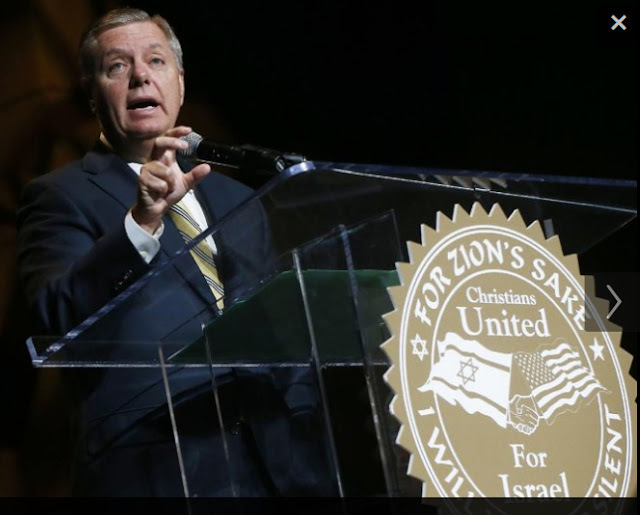 Did Lindsey Graham actually say that during a confession at the Christians United For Israel summit? Did his schizophrenic, multi-personality, sociopathic, psychopathic zionist self have a slip of the tongue and reveal his most secret innermost thoughts? It's too late Lindsey. You are well past the point of no return. No self respecting god will ever help you. There are about 1 in 300 people in this country who say they are members of CUFI or at least that's what the organization says. That's sort of scary. How did this ever happen? This is a fairly big cult that certainly acts against the best interests of humanity. Our government puts the little cults like the compound at Waco under siege and ends up burning most of them alive but the John Hagee faux christian/jewish cult church of wars for Israel and the bankers gets a pass. Cultists are sure judged differently in the zionist world. There's no help for the CUFI crowd. Their god of Israel doesn't exist. Never did. That's common sense for most of us but unfortunately common sense, logic, reason and discernment has been educationally corrupted by the very same ones who created these cults. I'm at a loss for words.....maybe you have some? cheer the Zionists on as they continually break the Ten Commandments.If I remember correctly,the golem is destroyed when it's no longer useful.Personally I hope Graham and his ilk are raptured as soon as possible.Fly off to heaven and leave us in peace,you scumbag.For the record,I'm an agnostic. Lindsay Graham is a closet sodomite. Homosexuality used to be classified a form of mental illness, before politically correct new speak became the norm. That Voltaire quote is timeless. - Every sensible man, every honorable man, must hold the Christian sect in horror. - May we not return to those scoundrels of old, the illustrious founders of superstition and fanaticism, who first took the knife from the altar to make victims of those who refused to be their disciples? - But that a camel-merchant should stir up insurrection in his village; that in league with some miserable followers he persuades them that he talks with the angel Gabriel; that he boasts of having been carried to heaven, where he received in part this unintelligible book, each page of which makes common sense shudder; that, to pay homage to this book, he delivers his country to iron and flame; that he cuts the throats of fathers and kidnaps daughters; that he gives to the defeated the choice of his religion or death: this is assuredly nothing any man can excuse, at least if he was not born a Turk, or if superstition has not extinguished all natural light in him. - The Jewish nation dares to display an irreconcilable hatred toward all nations, and revolts against all masters; always superstitious, always greedy for the well-being enjoyed by others, always barbarous — cringing in misfortune and insolent in prosperity. - Superstition is to religion what astrology is to astronomy, the mad daughter of a wise mother. These daughters have too long dominated the earth. - Where is the prince sufficiently educated to know that for seventeen hundred years the Christian sect has done nothing but harm? - All of the other people have committed crimes, the Jews are the only ones who have boasted about committing them. They are, all of them, born with raging fanaticism in their hearts, just as the Bretons and the Germans are born with blond hair. I would not be in the least bit surprised if these people would not some day become deadly to the human race. Talking about the 2nd war on Iraq (2003) one Ariel Natan Pasko stated that ... we already knew that this war was for us - i.e. the Jews and Israel. Chazal - our sages - throughout the ages have explained the Torah, telling us that everything that happens in the world is for the benefit of the Jewish People. Simply put another way, if all the world is a stage, then the Jews - and especially those in the Land of Israel - are the lead actors on the stage of history, and the goyim ... have supporting roles... As our tradition states, G-D (they can't even spell it out!) ... created the world for the sake of the Jewish people. and it is our responsibility to implement the Torah - absolute morality and the blueprint of creation - in it." These are not my words because I'm at a loss too. Somewhere I read there are 40 Mio CUFIs out there. Beyond scary. That 40 million may be right. Not all are official members of CUFI but still adhere to the same destructive myths and are afraid to question their own brainwashing. "Mankind, for the most part, hold to their religion through habit. They have never seriously examined the reasons why they are attached to it, the motives of their conduct, or the foundations of their opinions. Thus, what has ever been considered as most important to all, has been of all things least subjected to scrutiny. Men blindly follow on in the paths which their fathers trod; they believe, because in infancy they were told they must believe; they, hope, because their progenitors hoped, and they tremble, because they trembled. Scarcely ever have they deigned to render an account of the motives of their belief. Very few men have leisure to examine, or fortitude to analyze, the objects of their habitual veneration, their blind attachment, or their traditional fears. Nations are carried away in the torrent of habit, example, and prejudice. Education habituates the mind to opinions the most monstrous, as it accustoms the body to attitudes the most uneasy. All that has long existed appears sacred to the eyes of man; they think it sacrilege to examine things stamped with the seal of antiquity. Prepossessed in favour of the wisdom of their fathers, they have not the presumption to investigate what has received their sanction. They see not that man has ever been the dupe of his prejudices, his hopes, and his fears; and that the same reasons have almost always rendered this enquiry equally impracticable. Thus, religious opinions, once received, maintain their ground, through a long succession of ages; thus nations transmit from generation to generation ideas which they have never examined; they imagine their welfare to be attached to institutions in which, were the truth known, they would behold the source of the greater part of their misfortunes. Civil authority also flies to the support of the prejudices of mankind, compels them to ignorance by forbidding inquiry, and holds itself in continual readiness to punish all who attempt to undeceive themselves." Excellent commentary, it is evident you have given some thought to the subject. In this day and age, there have been so many myths perpetuated, so many psyops, etc etc, the discerning among us have learned to be skeptical and question everything. It is true many believe the bible to have been written by divine people simply because that is what they said in sunday school, their parents believed and so on. It is too frightening for some to even imagine that most of those people could have been wrong, their parents brain washed and living a lie. We know that Paul never met Jesus, Constantine studied in India before he called his henchman together and hammered out the bible. They debated as to whether or not Alexander would be divine also but decided against it. Many consider revelation one of the older manuscripts actually written without much change and the story of the awakening consciousness as the Kundalini travels up the spine. There was no such word as Jew at the time of Jesus. The Palestinians were called Hebrews or Israelites, later converted to Islam. However there was a hidden society call the Essenes who avoided the temple Israelites and lived in caves practicing something very akin to Buddhism. Edgar Cayce defines Israelites as those who seek the light. It may be more simple than we think. We do know Edgar Cayce existed and we do know he predicted hundreds of things, cures etc that did happen, discovery of Atlantis, pole shift … it is shifting now as the axis is in Siberia, and hundreds of cures that yes actually worked. Of course if you have never met anyone like this, it is hard to accept. Most of them are in India. It is good to question all but it can swing too far the other way. We can say there was no Jesus, Krishna, Sidhartha, Tecumseh, King Arthur, Thor, no pyramids, they are a delusion, no Babylonian tablets of the Elohim, no Mohammed etc, but that also would be deluding ourselves. How much of the true story was passed down over the ages is another story. I think they real words of Jesus exist, but then again they are nothing like the bible and Tecumseh, Seattle or Sitting Bull could have told you pretty much the same thing. I am pretty sure this is what Jesus did say. I know for a fact, this is what the HAU DE NO SAU NEE did say. I am not ready to throw out the baby with the bath water yet. Skepticism taken to the extreme is just another form of delusion. ...We are in agreement on the thoroughly syncretic character of primitive Christianity, evolving from earlier mythemes and rituals, especially those of Egypt. It is almost as important in Christ in Egypt to argue for an astro-religious origin for the mythemes, and there, too, I agree with the learned author. Let me outline the main argument that persuades me, some of it learned here, some already assimilated and facilitating my acceptance of much that Acharya offers. First, I find it undeniable that, as Ignaz Goldziher (Mythology among the Hebrews) argued, following the lead of “solar mythologist” Max Müller (yes, the great historian of comparative religion and world scripture), many, many of the epic heroes and ancient patriarchs and matriarchs of the Old Testament were personified stars, planets, and constellations. This theory is now ignored in favor of others more easily made into theology and sermons, but it has never been refuted, and I find the evidence overwhelming. And once you recognize these patterns in the Old Testament, you start noticing them, albeit to a lesser degree (? ), in the New. Hercules’ twelve labors surely mark his progress, as the sun, through the houses of the Zodiac; why do Jesus circumambient twelve disciples not mean the same thing? And so on. I find myself in full agreement with Acharya S/D.M. Murdock: “we assert that Christianity constitutes Gnosticism historicized and Judaized, likewise representing a synthesis of Egyptian, Jewish and Greek religion and mythology, among others [including Buddhism, via King Asoka’s missionaries] from around the ‘known world’” (p. 278). “Christianity is largely the product of Egyptian religion being Judaized and historicized’ (p. 482). I like D.M. Murdock. She is one of the best researchers there is in her chosen field of study. Her website is a must bookmark. Definitely one, and probably two, old testament prophets related how the nation of Israel would become utterly depraved and would be almost entirely obliterated as chastisement. It is obvious that the bloodthirsty power-hungry Zionists are leading the Jewish people on exactly this path to terrible destruction. They know they have overplayed their hand and fear their most terrifying nightmare will come to pass. That the fury of the entire planet is set to be unleashed upon them. And Zionism-Bolshevism has every appearance of a generations-long purposeful plan effectively to discredit and destroy Torah Judaism, and possibly monotheism in general. To be replaced by something utterly evil and anti-human. I'm disappointed that as an intelligent person, you still seem to believe we are something merely material, not something conceptual and spiritual. Everything will be clear in the end. Keep up the good work. We are on the cusp of some radical changes. "Hamburgers! The cornerstone of any nutritious breakfast."